This review by Robert Loerzel originally appeared in Pioneer Press on May 31, 2007. Iago is one of literature’s greatest villains, and a new production of “Othello” shows this infamous schemer as a fascinating and charismatic agent. John Judd’s performance as Iago at Writers’ Theatre is so remarkable that, at times, one thinks this play should be called “Iago,” not “Othello.” Thankfully, this production, directed by Michael Halberstam, also features a top-rate turn by James Vincent Meredith as the title character. This superb production is the first Shakespeare play in 10 years at Writers’ Theatre, and it makes a strong case for the Glencoe theater to take on the Bard’s work more often. The essence of “Othello” is Iago whispering his nefarious lies in Othello’s ears, and this small venue is the perfect place to make an audience feel like it is eavesdropping on private moments. In the opening scenes, as Iago begins plotting a complex plot of revenge against the Moor general Othello, Iago does not seem especially evil in Judd’s portrayal. Certainly, he is planning to commit dastardly deeds, but it also appears that he is merely doing what he thinks needs to be done — and going about it as efficiently as possible. Iago himself is a fabulous actor, persuading all of those around him that he’s honest and noble when he’s actually a Machiavellian manipulator. Judd masterfully pulls off Iago’s two-faced nature, putting on such an honest face during his moments of deception that one can almost forget it’s all a ploy. Judd’s Iago then takes delicious pleasure as he turns toward the audience with cocked eyebrows or a twirl of the hands, reveling in the mischief that’s he creating. In the play’s first half, Meredith plays Othello with a deep sense of pride and confidence. And then, as Iago begins to plant seeds of doubt in Othello’s mind and Othello begins to wonder if his wife, Desdemona, has been unfaithful, Meredith’s eyes stare off at distant points. Othello is searching his memory and his soul. When Othello becomes convinced that Desdemona has betrayed him, Meredith vividly captures his character’s violent emotional turmoil. 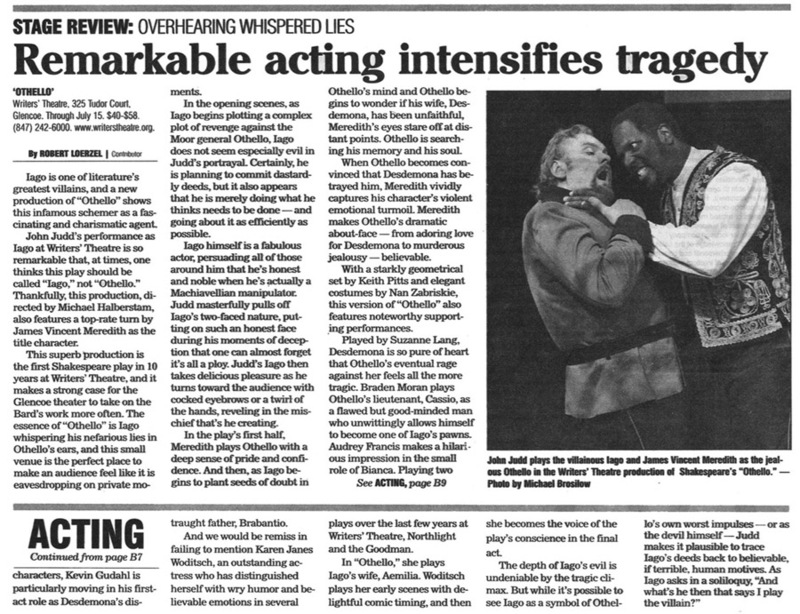 Meredith makes Othello’s dramatic about-face — his turn from adoring love for Desdemona to murderous jealousy — believable. With a starkly geometrical set by Keith Pitts and elegant costumes by Nan Zabriskie, this version of “Othello” also features noteworthy supporting performances. Played by Suzanne Lang, Desdemona is so pure of heart that Othello’s eventual rage against her feels all the more tragic. Braden Moran plays Othello’s lieutenant, Cassio, as a flawed but good-minded man who unwittingly allows himself to become one of Iago’s pawns. Audrey Francis makes a hilarious impression in the small role of Bianca. Playing two characters, Kevin Gudahl is particularly moving in his first-act role as Desdemona’s distraught father, Brabantio. And we would be remiss in failing to mention Karen Janes Woditsch, an outstanding actress who has distinguished herself with wry humor and believable emotions in several plays over the last few years at Writers’ Theatre, Northlight and the Goodman. In “Othello,” she plays Iago’s wife, Aemilia. Woditsch plays her early scenes with delightful comic timing, and then she becomes the voice of the play’s conscience in the final act.